Goals from Lionel Messi and Daniel Alves gave Barcelona a significant lead going into the second leg. Manuel Pellegrini unsurprisingly switched to a 4-2-3-1 / 4-4-1-1 formation, but surprisingly named two left-backs in tandem, Gael Clichy and Aleksandar Kolarov. Fernandinho was fit to return in midfield, while Martin Demichelis played at the back. Tata Martino was cautious with his team selection, playing Andres Iniesta on the left of a front three, with Cesc Fabregas in midfield. Barcelona enjoyed unprecedented spells of possession for an away side at the Etihad, but failed to convert their dominance into clear-cut chances in the first half – before Demichelis’ rash tackle at the start of the second half changed the tie. 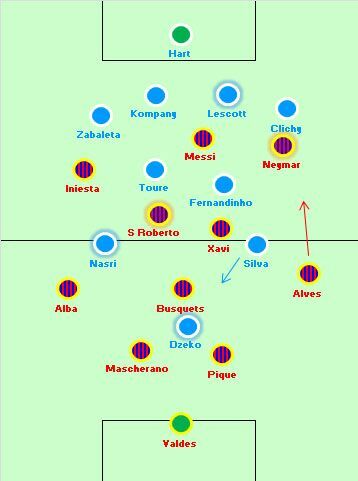 This was a standard 4-2-3-1 against 4-3-3 battle, with Barcelona dominating possession and making City’s shape more 4-4-1-1 for long periods. Barcelona dominated more than Pellegrini would have anticipated – it’s simply not in his mindsest to allow the opposition such freedom on the ball. Nevertheless, City actually coped well with the sustained pressure in a purely defensive sense, although they didn’t counter-attack much, because they’re not accustomed to playing in this manner. Martino’s decision to field an extra midfielder was noticeable from the outset, as Barcelona were amazingly dominant in terms of possession. Their superiority started in defence with Sergio Busquets dropping back to create a 3 v 2 around Alvaro Negredo and David Silva, then shuttling forward into midfield to create an overload there too, and basically making sure Barcelona were always playing triangles around City. Higher up, Fabregas remained in midfield and Andres Iniesta drifted inside to become an extra midfielder. The game’s two most common pass combinations were Iniesta and Fabregas playing the ball to reach other. Furthermore, the full-backs remained in deep positions, and offered a passing option rather than a penetrative option breaking in behind. Barcelona always had options on the ball. City were successful with their aggressive defensive plan against Chelsea on Saturday, the back four charging forward quickly to prevent Chelsea’s attackers turning. Here, they were defending much deeper against a possession-based side rather than a counter-attacking side, but there was a similar approach. Gael Clichy tracked Alexis Sanchez closely and Pablo Zabaleta followed Iniesta but passed him inside to Vincent Kompany when the playmaker moved narrow. 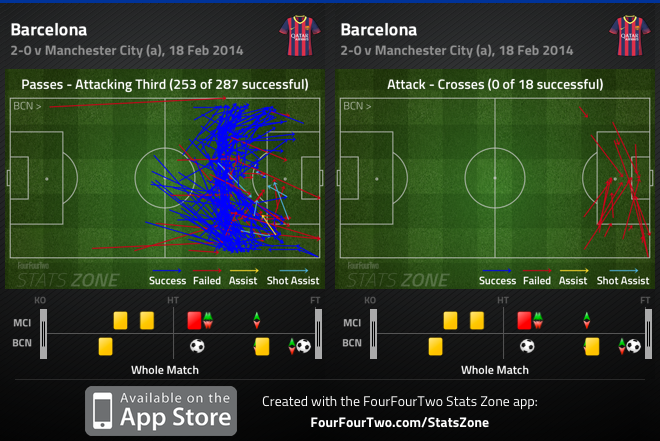 Whenever the ball was played into Barcelona’s three forwards, Manchester City pounced quickly. 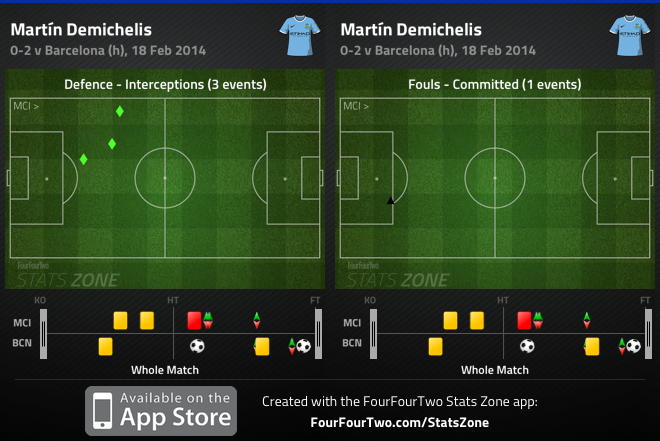 The key battle, though, was Demichelis – generally seen as City’s weak link – against his compatriot Lionel Messi. Throughout the first half, Demichelis actually performed very well: he was proactive, he read the game nicely and he intercepted balls played into Messi’s feet. His distribution was a cause for concern, as his wayward passes invited more Barcelona pressure, but he was generally in command of the situation. In fact, the one time Messi got past a City defender, it was Kompany who had been turned – he was penalised for a shoulder barge – although he made a couple of fine challenges on Messi in the second half. City attacked sporadically, but Victor Valdes was called into action more than Joe Hart before half-time. City usually attacked down the left, with Daniel Alves brought up the pitch and lured into a few early fouls. Jesus Navas was quiet on the right, although a couple of crosses from either flank highlighted Alvaro Negredo’s aerial threat. More surprisingly, there were a couple of times when City caused problems in central positions. One excellent Kompany forward pass allowed Silva to get the wrong side of Busquets, later Toure drove forward dangerously to allow Navas to cross, and Silva and Negredo almost played a lovely one-two on the edge of the box. Considering City weren’t seeing much of the ball, they were using it quite efficiently. They could have been better on the break, though. Their only truly notable counter-attack was very early on, following a Barcelona corner. In open play, the Barcelona’s full-backs rarely advanced into the final third, and neither Xavi nor Fabregas looked to get in advance of play, so the away side always had men behind the ball when attacks broke down. The drawback to guarding against counter-attacks, however, was that Barcelona never looked like scoring in the first half. Sanchez was the only player running in behind the defence, and while City’s strategy of pushing up and closing down worked well, it’s an easy strategy when there’s no danger of another opponent running in behind. Zabaleta wouldn’t have got as tight to Iniesta, for example, if Jordi Alba was constantly overlapping past him, and Demichelis’ job would have been harder had if Fabregas was bombing on past Messi. Barcelona played in front of City rather than penetrating them – there were few passes into the box, and crosses were always unsuccessful. One incident changed the entire tie. Barcelona’s build-up had been gradual and patient, but City were opened up by a move completely uncharacteristic of Barcelona’s gameplan. They’d played a succession of unsuccessful 25-pass moves, but the key moment came when they won the ball inside their own half, then immediately played the killer pass to Messi. It was a one-pass move. The Argentine had been dawdling in an offside position after a Barcelona attack had broken down, and his brilliant positioning meant it was almost impossible for Manchester City to stop him. You can question Kompany’s decision to retreat, meaning Messi became onside sooner – but it’s an incredibly rare situation with a striker retreating from a clearly offside position, and with a midfield runner on Kompany’s outside, he essentially had to consider three players and look in two directions within a couple of seconds. Messi waited until City’s centre-backs had dropped back to play him onside, then timed his dart towards goal – and Iniesta played the pass at the perfect moment. Demichelis was now in a completely new situation: he was happy when advancing forward to close down Messi, but wasn’t comfortable when the ball was played behind him. The double punishment of a (scored) penalty and a red card means it’s easy to suggest Demichelis should have stayed on his feet, and allowed Messi to shoot. However, he wasn’t to know the penalty would be converted, or that the penalty would be awarded in the first place, considering how close to the edge of the penalty box the foul occurred. In fact, it’s even arguable that the difference between the referee awarding a penalty and the referee awarding a free-kick was the difference between Demichelis’ foul being regarded as either foolish or beneficial – and considering it was such a fine margin, it’s tough to be too harsh. In fact, Demichelis’ half-hearted challenge suggests he understood his mistake halfway through – perhaps as he realised how close he was to the edge of the box. He slides, but doesn’t really tackle. Maybe Demichelis should have let Messi shoot. But this is hindsight thinking, and it’s difficult to remember any defender letting an opposition striker shoot, for fear of being dismissed if he mistimed his tackle, and being praised for such intelligent forward-thinking. With ten men, Pellegrini soon made two changes, removing both his wide players and introducing Joleon Lescott as the replacement centre-back, plus Samir Nasri as a more creative wide option. It was a 4-4-1 formation, with Pellegrini hoping that Silva and Nasri would drift inside to give City options in central positions, and therefore not leaving Alvaro Negredo (and later his replacement Edin Dzeko) isolated, as well as encouraging the full-backs forward. And, in fairness, City had a couple of decent moments when the full-backs overlapped. Clichy got forward dangerously but then played a poor cross into the hands of Valdes, while Toure switched play to Zabaleta, who produced a knock-down that was followed with Silva’s excellent chest-and-shot. Barcelona were frustratingly cautious with a man advantage, and it felt like Martino should have introduced an extra forward, gone with a proper 4-3-3 to really stretch City, and killed the tie before the end of the contest. Instead, Neymar was a straight swap for Sanchez, which changed little. The main man in the second half, however, was Alves. Now no longer being tracked by Kolarov, he took advantage of his freedom and played an extremely attacking role in the second half. He squared for a fine Xavi chance, blasted narrowly past the far post after racing in behind, and then finally doubled Barca’s lead after a fine interchange with Neymar. In this situation, Alves was the perfect full-back. A strange game to analyse: City didn’t play as they would have anticipated and were forced to withstand heavy pressure, but did so effectively for long periods. Demichelis was the biggest worry on the teamsheet and turned out to be the villain – but throughout the first half he’d actually defended very well against Messi. Barcelona were very cautious in possession, both at 0-0/11 v 11 and 0-1 /10 v 11. They made City’s aggressive defensive strategy easier because of the lack of forward running from midfield and full-back, and risked not putting the tie to bed in the second half. Alves’ energy ensured they take a commanding lead into the second leg. As a Barca fan it was frustrated to watch that Martino didn’t went for the kill when city being reduced to 10. I had the feeling that if he brought Pedro or Neymar for Fabregas they profit a lot more of city being a man down. Now they had some bad luck being denied a goal but they didn’t create too much treats. Luckily Alves scored the 0-2 so the lead for the home game in 2 weeks is comfortable. Also it’s nice to see Alves approaching his old form. Completely agree. As soon as the red was shown I was hoping he was telling pedro/neymar to go warm up to go in 5 minutes. Having this 2-0 advantage we would take any time so I am happy with that but I was hoping for a more attacking play in the last 40 minutes after the red. Excellent analysis. Too much can be read into just one result, but had City kept a clean sheet as their initial team set-up suggested, it would have been more of a knock on Barcelona than credit to City. Barca set up to dominate play, and hoped to sneak a goal without conceding any themselves. Although one could say that they achieved that, the truth is City were doing a fine job before the goal, and on another day Barcelona might have had taken a 0-0 back to Camp Nou, a dangerous scenario against a team of City’s caliber. It was strange Tata wasn’t as adventurous given that Aguero was missing, but then again Tata is not your conventional Barca manager. City now have to score 3 without reply to have any hope in the tie. One wonders what the result might have been had Pellegrini had Pepe instead of Demichelis at CB. Truly the phrase “turning radius of a lorry” was invented for him. you mean 2 without reply. 3-1, 4-2, etc. is good enough result for them. Yes I don’t think a 3-1 is impossible because City are random as hell. When everything clicks they’re a ‘Bayern style’ force due to the power, speed and individual skill in the team. Incidentally, his ref rant is bonkers – especially after claiming its mourinho who’s the evil one. By golly that first 20 minutes was dire; keeping possession without any intention of exploiting it is drear. Did you notice one fine piece of play from the TV director? He showed us a close-up of Clichy so that we could see that he was exhausted; soon Alves got his goal by attacking through Clichy’s zone. I saw a replay: I was watching ITV. He was nearly a yard onside, as the commentator said. While I agree that the first 20 minutes wasn’t the most attacking. It would have been horrible if Barca went down 1-0 very early on with a counter attack or on a set piece. There is also times when barca are not always the greatest when the games first get going (man united twice, multiple times against Madrid). Not saying City were going to start dominating if barca didn’t try to just control possession at the beginning. 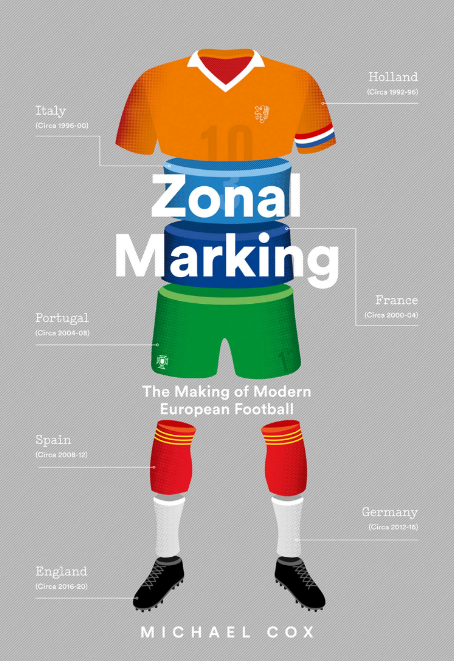 ZM, I am afraid, you are not giving enough credit to Martino. Barca have a bad away record in CL knock outs and they are up against the current best attack in Europe. And Barca also have a back line which is , you know..
All what Tata wanted was to controll the game as much as possible and may be get an away goal and to not lose this match. And that was very clear in the way Barca played, especially the forward line. As you rightly say, there were no forward runs at all. 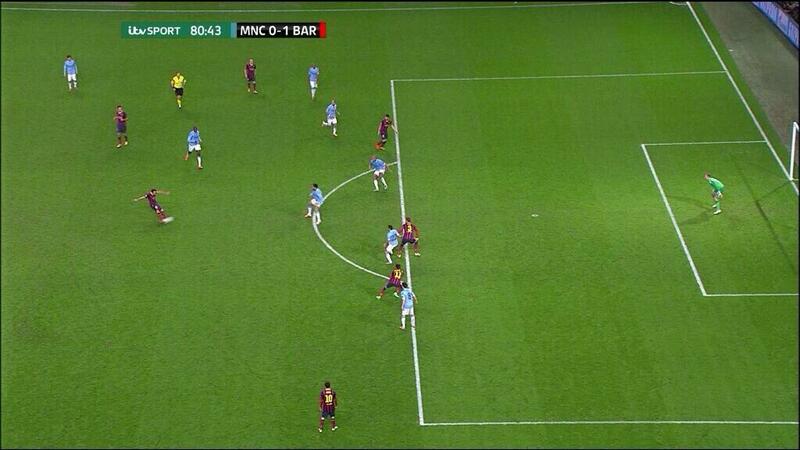 Barca did try something, and City defended well, but they didnt want any risk at all, thats all. Barca wanted a clean sheet at the end of first half and then try for something in the second half – like they did many times this season (under Tata Barca have mostly improved in the second half). And the best way to do this was just keep the ball and they defended well by having the ball and protected their back line, without getting adventurous. You only need to look at how Barca played with a man advantage to see, how they wanted to protect the back line, without trying for any adventure. Normally, Barca would have tried to kill it off and Messi would have tried to improve his records, but they kept quite. The single pass is not at all uncharacteristic of this season’s Barca. These are some of the tweaks Tata have introduced this season. Even last week end Cesc provided one such pass for Mess, which he chipped in. I can only admire Tata, as he managed an away win, without even shifting out of the second gear. Even against a mid/low table liga side, Barca have to sweat it out. But they were so fine, at the end. I much admire the heart shown by City players, when down by 10men. This tie is not over yet and Tata will know that for sure. But am sure, Barca will use their 3rd and 5th gear more in Nou camp. Its sad to see every one bitching Demichilles though. It was a tough situation, with none other than Messi. He was helpless. you’re totally right. in fact this season barca is the team with most goals from counter-attacks in la liga (!). now that’s saying something. In fact, according to WhoScored, they top the 5 major leagues with 9 counter-attack goals. you make great points…and critics always want to have it both ways. barca has been hurt on the counter (particularly away in the CL) so many times. experience tells them to shoot for a positive result and take their chances at the camp nou. it’s not like they were up against second rate competition in city. further, they did have some good chances in the first half (why iniesta didn’t pull the trigger in the box is beyond me). you don’t go to the etihad (especially with the way city have been playing this season) and go guns ablazing. and even at 0-1 up, they are in prime position. why take huge risks? besides, the second goal came through pique/fabregas much earlier in the proceedings…it was working. Any sensible defender would just close Messi down from behind to exert pressure and hope Hart saved the shot. Even if City conceded, it was still 11v11 and they still had a lot of time and tactical options to turn the score. City still had a lot of attackers, about 40 minutes left, another 90 minutes at Camp Nou, and home crowd to rally their attack. Of course Demichelis couldn’t consider all of them in instance. But, considering that they trailed 0-1 at 54 min, it wasn’t disaster at all. Trailing 0-1 with man down is. And mind that Messi hadn’t beaten Hart. There was still a chance that Hart saved it albeit small chance. We could justify Demichelis’ tackle IF he did it far outside the penalty box. But how he still insisted to tackle Messi around penalty box line….it was just terrible. Being sent off was bad, but sent-off plus conceding penalty is worse, let alone conceding the goal at the end of process. I always say, if you need to commit a DOGSO, aim at the ankle or a few inches up. Demichelis got sent off for nothing. Rajesh is spot on. This was a vintage Barcelona performance as we’d have seen in the Guardiola era. Barca was happy just to keep the ball, and let City get dizzy. Barca’s goal was only a matter of time as City wore down. Barcelona threatened to shred City nearly every time they thought about venturing out of their shell. Iniesta gave the first notice early on with a mazing run through midfield after City found a bit of courage. Martino’s away strategy has been to patiently wait out the opponent, taking few risks when the opponent is parking the bus, and baiting them into mistakes. City’s players are not capable of pressuring Barcelona in a tactical manner, and Pellegrini is incapable of translating it as a manager. Over the 90 minutes, City only played well for maybe 15. Barcelona toyed with them for the other 75. Xavi was at his best. I agree with Rajesh about the movement. Fabregas and Iniesta were constantly changing position in the first half. At times it was almost as if barça had no left wing at all. I also believe that the lineups were interesting. City deployed Kolarov in front of Clichy. Maybe that was an attempt to check Dani Alves’ runs. His goal came in a combination of him with Neymar against Clichy with one of city’s defenders coming in to help out of position. After Kolarov was benched Alves enjoyed a lot of space. But in the first half he struggled and commited many fouls. On the other side of the field, Alba held Navas well and the choice of playing Iniesta as a left winger might point to a concern in checking Zabaleta, who tends to run forward too. Of course Iniesta is far from a great tracker, but he does a better job at it than Neymar, who normally plays on that side, but was played in the opposing wing. btw what about piqué’s movement after the red card? the article doesn’t say a word about it, i don’t know why. it wasn’t just alves who started to move higher up the pitch, but also piqué. so the “frustratingly cautious” phrase is not entirely true. just because you don’t change to standard 4-3-3 instantly, it doesn’t mean that you don’t try to exploit the one man advantage. good article as usual. Xavi as usual the “hub” of everything. yaya had the most touches for City with 72. Xavi had the most touches overall with exactly double that = 144. http://www.whoscored.com/Matches/790670/LiveStatistics/Europe-UEFA-Champions-League-2013-2014-Manchester-City-Barcelona . always suprises me that both he and Busquets aren’t marked a bit closer. Busquets had 97% pass accuracy. XAVI 96%. Fernandinho had an impressive 97% too but off a fairly low 40 touches. those 2 are almost impossible to tackle, so to stop their flow you must mark them, and block passing angles to them. perhaps easier said than done but i’ve not seen it tried much. Spot on Rajesh and Maquina. As we all know, Pep only managed 3 away wins in the KO stages. The pattern is always the same. Pep even managed to loose against arsenal in 2011, with 1:0 up ! Although a legit goal was disallowed. To me the approach made perfectly sense. As expected Martino flooded the midfield with passing midfielders. Maybe we will get to see more of this in later stages if Barcelona will progress. To me this is pretty interesting cause, I see some transformation of Barcelonas classic 4-3-3 in it into some sort of 4-4-2. Many forget that one great benefit from tiki taka is denying the opponent the ball and so chances to score. Further it tires the opponent, so that late on the game can open up and you will get better chances. Of course this was not a perfect performance, but Barcelona had to prove a point and thats what they did. They kept the ball and controlled the game patiently waiting for the one moment, which arrived. After that, they knew city had to do something, but stil they knew keeping posession and a clean sheet was vital. Thats what they did and if Pique’s goal would not have been disallowed the game would have been finished anyway. It is difficult to put a shape on Barcelona because of the interchanging in midfield, and Messi’s vague trequartista role. Martino is interpreting this in a more classical Argentine manner as they’ve embraced the trequartista as no other country has. With the player selection against City, I would call it a 4-1-2-2-1. Alba and Alves were effectively the “wingers.” Sanchez has increasingly adopted striker-like responsibilities under Martino which has allowed Messi more rest. Sanchez pressures the CBs while Messi does what he likes. 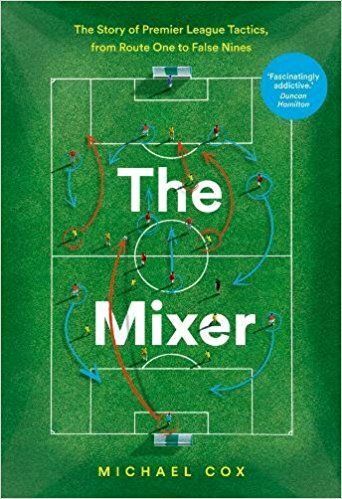 Very 80s Brazil-like from Barcelona, in terms of narrowness, multiple playmakers, and the fullbacks having the flanks to themselves for the most part. With Pedro, Sanchez and Messi forward, you see more of a classic Argentine type of form take shape (4-3-1-2). 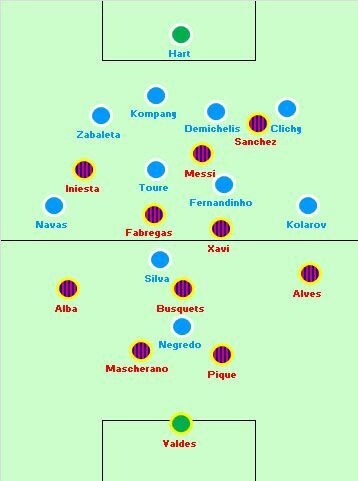 Barcelona only resembles a classic 4-3-3 is when Neymar or Tello play the left flank. Even so, it is highly unconventional as Barca decides to leave a chasm in front of the CBs- leaving Sanchez wide right and Messi dropping to tip what’s effectively a midfield diamond. Neymar and Tello are more traditional outside lefts. Pedro does not maintain the same width. Even in this case, it is strikerless, and not many clubs have or can play in such a manner. Spaletti’s Roma were the original to do it with Totti. the debate goes on and on for now about nearly 6 years. Last year I thought that Barcelona would not struggle against Bayern, because Bayern are a posession side as well. But Heynckes accepted the midfield superiority of Barcelona and instead choose to attack traditional Catalan weakspots. It would be interesting to see if, given they meet again this campaign, Bayern with Pep will finally try to “outplay” them and challenge them in terms of posession. Because I dont see any other team capable of doing so, considering seeing what happened yesterday with city. 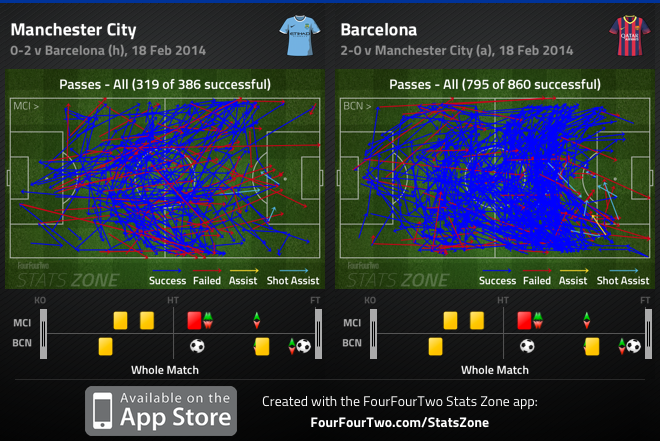 Barca pressed City every time they had the ball in their half- which was quite a bit. City did not have an effective counter-attacking plan, and that meant they just chased and got tired basically. I expected Barcelona to be comfortable defensively with no Aguero to worry about. That is the kind of player who causes Barcelona the most problems in open play. The only real threat was set pieces. What surprised me most was Pellegrini’s failure to put anyone on Busquets. Silva moved away from the center of the pitch, and Negredo simply waited to get on the end of long balls. He wasn’t doing any defensive work. Pellegrini’s tactics get a C- for me. There was some logic in the general idea, but the application was very sub-standard. The referee also removed a perfectly fine Barcelona goal, so I don’t think they were lucky on the balance of things. Well.. you don’t know how the things would’ve gone without the first goal. Maybe Barcelona would’ve win with a clean 3 or 4 – 0 or maybe it would’ve been a draw or a win for City. Don’t see what Barcelona/Martino have changed from last year’s problems? 11 v 11 the possession had no penetration what so ever and was extremely easy to defend against. If City played with more aggression on the counter attack, they’d have done better, but the counter attacking was poor. Munich, R.Madrid, Chelsea beat Barcelona in my opinion. It’s simple: around the same time last year they got beaten 2-0 in San Siro by a very inferior AC Milan. This year they’ve just beaten 0-2 the (arguably) strongest team of the Premier League, keeping a clean sheet against a team that has scored 120 goals in the season so far. So Martino must have done something good, no? i think i agree with george. maybe it’s not that barcelona didn’t penetrate, it felt more like they were too cautious to do so, and prefered to keep the ball instead of attacking. it was definetely not attractive, but one can say it worked. I agree with George and Pedro on this one. In my opinion I think thats why Tata started with 4 central midfielders knowing only Sanchez would be making diagnal forward runs, so that means less risks being taken. Imagine if they would of lost with a 433 formation. City would have 90 minutes of experience against that. If they were losing yesterday then that means that Tata could of sent Neymar/Pedro in for one of Iniesta/Cesc/Xavi to make us more of a threat going forward and would of made the game more attacking for barca. Yes George, but when City have come up against the best (Bayern, Chelsea, Liverpool deserved at least a draw as well) they’ve struggled. City just looked terrified to commit players to attacking Barcelona, if they had done, surely they’d have had success? Most teams have shown the blueprint to beat Barcelona, defending in a deep and narrow shape close to the box, which also helps restrict the space to Messi, and then springing counter attacks. 50% they did brilliantly, 50% they just didn’t commit to. You can analyse the game in great detail, but basically it comes down to the fact that Barcelona got lucky with City going down to 10 men. The problems still exist, vulnerable to counter attacks, defensively not great. What has Martino done to change that? They just won’t get picked up on as people will focus solely on the result. Not sure about that: for the time being, Barca has played against 3 strong teams – Atletico Madrid three times (twice 0-0 and once 1-1), Real Madrid (beated them 2-1) one time and MC one time. They’ve managed to keep a clean sheet in 3 of those 5 games while haven’t lost a single one. I think that with Martino they’ve recovered the pressure they lost last year. They’re also playing more direct when needs be. Meanwhile only two other teams have managed to win at the Etihad, namely Chelsea and Bayern Munich. I don’t think they were “lucky” yesterday: if anything – between the handball in the penalty area in the first half and the wrongly disallowed goal of Pique – they could have come back home with a 0-4…yes, city’s tactic was probably not brave but it’s also good to highlight that Martino got it right. Maybe Barca is learning to cope with these teams that use the “blueprint”. Just don’t commit as many numbers forward, then the opposition does not have as much to counter attack against. Sure it may be boring, but Barca has just as much right to not penetrate if the team is just gonna sit deep and defend all match. I fail to see how you figure they were vulnerable to counter attacks in that match up either. I don’t remember City threatening at all on counter attacks. City had some decent moments but nothing from counter attacks that I recall. I think the only thing people miss is that Barça defend with the ball. So when it seems that they are just having a kickabout without really looking to penetrate, oftentimes that is exactly what they are doing. Because when you don’t have traditional defenders, you need to limit scoring opportunities against you in some way. Keeping the ball is the most effective way to do that. Pellegrini surprised me in that he played into the possession/defense game by not pressing the midfield more, instead allowing Xavi/Iniesta/Busquets/Fabregas to ping it around as they wished for the most part. They had success with more pressure in the second half, but the officials were calling a more lenient match by that point, “letting them play” so to speak. Two away goals is immense. Three or four would have been better, but it’s also worth noting that Tata Martino is a pragmatist to Pep Guardiola’s romantic. Of course, looking back at the Guardiola history in away legs will reveal some pragmatism as well, but Martino had a plan and knew exactly how to implement it. The surprise for me is that Pellegrini played right into it. The Neymar on the right was also really smart. Alves was already having attacking success on that side. Adding Neymar to the equation was a good move that brought results. Another thing not to underestimate is the quality of the Barça passing. Just because it looks easy, doesn’t mean that it is easy. Those balls were flying around with some serious zip on them, and they were being controlled and redistributed. Truly an impressive display. I don’t think we know how good this club is yet. Mind you that is my culer soul saying that, but Neymar still isn’t fully integrated, never mind being fully integrated with Messi. Neither he nor Messi are fully match fit yet, but should be soon. People exaggerate the weakness of Barca’s defense a lot, it’s just very difficult to defend with so much space behind you especially with all those fast attacking players these days. Can’t think of a team with a defense who can do this much better. Also hear a lot of comments on the defensive style of City but the first time they really tried to attack for a long period of time Navas lost the ball and it ended in the sending off of Demichelis and the penalty. I absolutely agree, Barca defense is very good though it does not always look good. Masche and Pique are very good defenders and the best Barca can have. Ability to pass the ball and be position-ally aware is more important than the ability to tackle and win headers. Also it most often falls on Alves and Alba to provide width. It is not easy to defend then 2 or more players break at you at speed with only couple of men back to stop them. Referee was awful. Whenever City won the ball back he blew his whistle. Makes it hard to counter attack when the referee stops play everytime you get the ball. What annoys me is how lots think it was Barca playing for the draw. If a team sits back & waits like City did, what do you expect? Against Barca, a team who are very accustomed to playing against that tac’, this is what you should expect. piqué and mascherano are not pacey. i see the exact opposite of that under martino, in fact. the defenders are sitting deeper than before in general. barça presses with midfield and attacking players, but the defenders never go forward in rush, and not very high anymore. not like when pep was in charge. but one thing that you have to admit is that mascherano only got beaten by negredo in the air (because of the obvious difference in height). For all the tactical variety possible, both managers ended up being cautious, which ironically means being in real trouble if you concede the first goal. If City had scored first, Barca would have had a hard time mentally adjusting to having to attack after just cycling the ball around for so long. Same vice-versa, which is what happened. BTW, I guess Martino is saving Mascherano as DM for the next round!